“Oh, no, not Bambi!,” cried the fashion magazine editors when I pitched them on truly sustainable, eco-conscious and gorgeous leather bags made from carefully managed wild deer populations in the vast Highlands of Scotland. No matter how I tried to explain that this was so much better than the horrible factory farming of cows that produced the leather that all the other luxury bags were made from, the editors just simply didn’t get it. “Oh, no, not Bambi!” Again and again we heard this same refrain. It was only when we hit upon the idea of calling this a new “Slow Luxury” did editors and buyers suddenly grasp the concept. They suddenly “got” that adding a sustainable, responsible story and value aspect to redefine the idea of “luxury.” From here we had major interest, and the bags were featured in Vogue, Wall Street Journal, Forbes, Huffington Post, and Women’s Wear Daily, and the collection was nominated for ‘Accessory Designer of the Year’ at the Scottish Fashion Awards. The collection launched and was sold at Saks Fifth Avenue in New York and ahalife.com. We partnered with Textiles Scotland to introduce Slow Luxury via a round table of sustainable heritage Scottish manufacturers (see below in this logo spread) and visiting United States editors. Since this beginning of Slow Luxury in Scotland, in New York, we have hosted pop-up events in top spas and lifestyle showrooms, designed fashion shows in Bryant Park and hosted a trends panel for the International Contemporary Furniture Fair trade show. We launched the Immortal Beloved perfume in 2016 at the University of Arizona Art Museum, and a matching coloring book and four new perfumes in 2018. Jade Dressler has enjoyed over 20 years in sustainable luxury product design, curation, and development, with the past nine years as Creative Director of her branding agency based in New York, Jade Dressler. 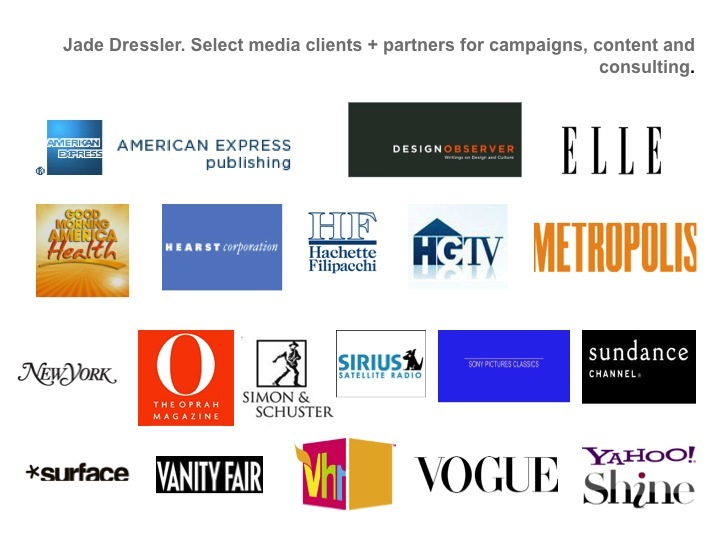 The agency creates strategy and platforms for luxury and pop culture lifestyle clients at the conﬂuence of red carpets, couture runways, and the sets, stages, screens, theaters of retail stores, e-commerce and major media. Jade’s introductions and connections set the style for desire. Of note, Jade has designed for luxury fashion legends, Bill Blass, Mary McFadden, and Oscar de la Renta and was a product developer, designer and the Marketing Director for Blue Fish, one of the ﬁrst socially conscious, organic cotton clothing companies with ﬁve multi-category retail stores and over 400 wholesale accounts, including Nordstroms in the 1990’s. Blue Fish was a member of BSR, Businesses for Social Responsibility and SVN, Social Venture Network with board members including famed pioneers of corporate responsibility, Ben Cohen of Ben & Jerry’s Ice Cream and Gary Hirschberg of Stonyﬁeld Farms yogurt. 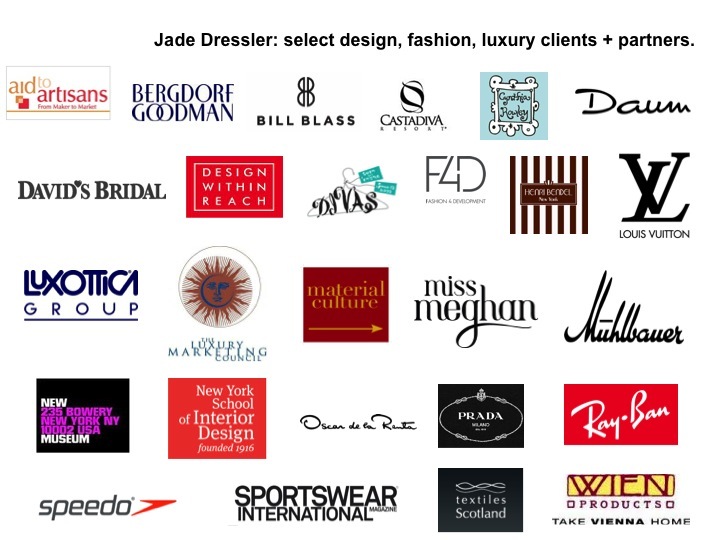 Jade’s expertise and vision for design businesses is based on her experiences as a co-owner and designer of an accessory collection which was carried by Saks Fifth Avenue, Henri Bendel, Joyce Hong Kong and specialty stores around the world. The brand, called JAMP, enjoyed representation by Fragments in NY, and reps in Miami, and Paris. Notable wearings by celebrities ranged from Naomi Campbell to the band, Heart; and features of the brand appeared in media such as Elle, Vogue, and WWD. Jade’s column on green art and design products from Miami to Milan for Metropolis magazine reflected her passion for luxury and green developments, trends and resources. As a former consultant to the New York School of Interior Design, she enjoys a network of leading artists, architects, and designers in interiors. 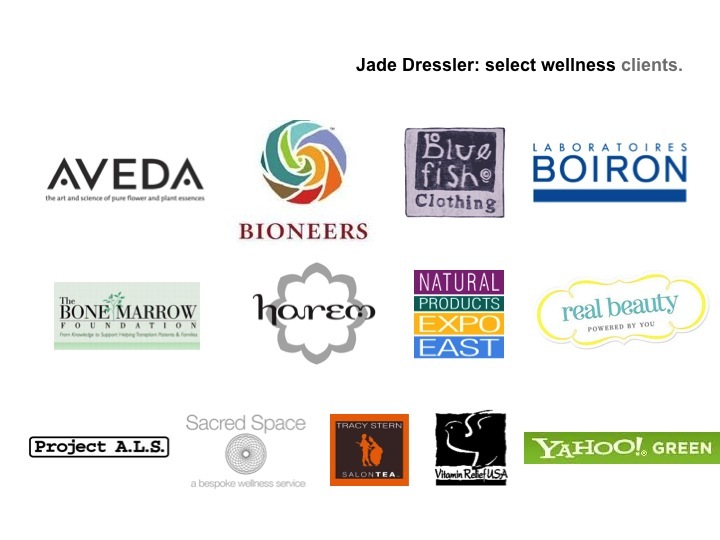 Jade also has represented and done creative consult for wellness clients scaling from Natural Products Expos to branding and media for one of the nation’s top integrative physicians, Dr. Vincent Pedre. For Jade, wellness includes mental health advocacy through her clients, Janine Francolini with Flawless Foundation. Her Green Provocateur initiative commissions art installations on the land to call attention to the beauty and balance of Nature in projects in places ranging from Brazil to Italy to NYC’s Union Square Park. As business consultant to Slow Luxury and clients, senior executive consultant, John Favreau brings to Slow Luxury his operating, marketing and transaction experience in luxury and mass market consumer products, fashion, apparel and accessories. His career in international market development and M&A has provided him with a global view of today’s consumer and economic environments. Having lived in New York, Paris, London, Frankfurt and Sydney, Mr. Favreau well understands the global, cultural and societal impacts of the ever-evolving consumer markets. In his transaction work, having led the investments of over $1.8 billion, he also knows well the key drivers for value creation and company growth. Favreau leads Little Lake Partners, LLC, an exclusive consulting firm that provides strategic, financial, operational and brand management and marketing capabilities to solve problems and create greater opportunities for growth oriented businesses, including start-ups and joint ventures. Little Lake Partner’s diverse client engagements have included two new consumer product launches, the strategic divestiture of an iconic American design brand, and business advisory services to a leading US apparel designer, a luxury women’s apparel line, and a branded lifestyle company, among many others. Favreau has contributed to the cultural interweaving of our global economy through his successful brand expansions, such as expanding New York-based Dean & Deluca; legendary brand, Vera; and Armani Exchange, A/X into Japan along with his client placements on the shopping channels, HSN and QVC, of America. Most recently, an invitation to an “Arctic safari” led to brand evaluations in outerwear, neck wear, home furnishings and textiles, and sequential US market introductions with sales strategy support and direct introduction to retail and wholesale accounts. In his current work, he is leading the revitalization of a sustainable organic cotton based uniform business, the launch of a highly curated collection of products based on atelier based handwork (from rural Pennsylvania Amish communities, Kazakhstan based felting circles, and Peruvian alpaca knitters) as well as the US market entry for a UK swimwear line that utilizes classic French lingerie production to make it’s highly unique product line. Favreau is also an Adjunct Professor at LIM College, in New York City, where he teaches new product development. He holds a BSE in Finance and Multinational Management from the Wharton School of the University of Pennsylvania, and is fluent in French. Jade, you’re a star! I always knew it, but now it’s confirmed. Excellent team Jade!!!! love the energy….